A border between states is the strongest line a human can draw”, says world-touring graffiti artist EGS. Journalist Reetta Räty met EGS in Helsinki. Let’s imagine we are sitting in an airplane. We fasten our seat belts. We then grab the inflight magazine from the seat pocket and flick through to the map pages at the end. Dozens of lines crisscross from big cities like Frankfurt and London, whether long, short, or arching all the way across the entire spread. The lines denote flight routes. These days, you can fly to the other side of the world in less than a day. Well, assuming you have the right passport, visas, and credit cards. Let’s keep flicking to Central Asia. Gigantic Kazakhstan eight times the size of Finland has a similar shape to Mongolia, and a border line that meanders between Russia and China. The African continent has a familiar form, as do its arrow-straight borders. Egypt is a box, Libya has a pointed end. Maps are images of the world, yet borders that divide states are human inventions that keep changing with the passing time. Let’s close the magazine, and ask the air hostess for a small bottle of white wine. We’ll have a look at some other types of maps. Maps drawn by Finnish graffiti artist EGS. Three large works of art hang from a workspace wall in a former industrial building in Helsinki. The triptych is an interpretation of the world map. Upon closer inspection, you notice the continents forming the letters E, G, and S.
EGS is a Finnish, world-touring artist, whose trademark – or life’s mission – is encapsulated in the three letters. He has painted along streets, in tunnels, and on the side of trains in over 50 different countries, but is also the first graffiti artist whose works have been bought by the Finnish National Gallery for its collections. He has chosen not to appear under his own name, and there are no public images that show his face. EGS has dozens of abstract maps sprawled across his workspace floor. The countries are difficult to recognize, which is not so much down to the abstract nature of the works, but the subject of the exhibition he is working on. He will be opening his biggest exhibition to date at Kunsthalle Helsinki in January 2018, devoting the preceding 1.5 years solely to working on the exhibition. Helene Schjerfbeck, Reidar Säreistöniemi, Andy Warhol, Alvar Aalto, Kaj Stenvall, Marlene Dumas, Arne Jacobsen, Eero Aarnio, and Eero Saarinen. How does it feel to follow suit? “I’m really flattered”, says EGS. 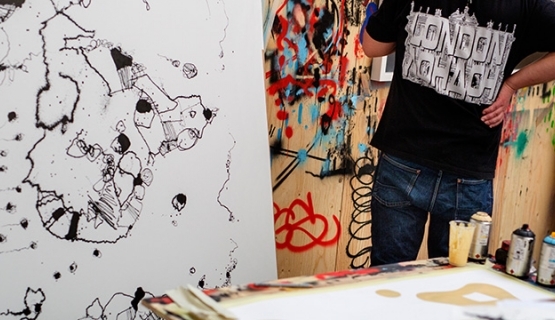 Graffiti artists have had to get used to their works being displayed in group exhibitions, as part of a wider phenomenon. But now EGS will fill the entire Kunsthalle with his works: maps, sculptures, and paintings. It’s fantastic and nerve-racking at the same time. “Graffiti was about marking my own city”, remarks EGS. He would paint with locals in different parts of the world, usually on the outskirts of a city and deserted wastelands. Born in 1974, EGS is now 43 years old. He sees the graffiti trips of his youth as the equivalent to Erasmus exchange periods. Doors were wide open into Europe, and he had a chance to broaden his mind. Not everyone lives or thinks the same way, or values the same things. What did you parents think about your travels? But EGS is grateful for being allowed to go, seek new things, and learn about the world. The young Finnish men weren’t deterred by borders between countries. As an adult, EGS has continued to travel, flight distances only getting longer. As a youngster, he’d go where graffiti was a big thing, but now seeks out places where it’s a novelty. From Europe, he has continued to Africa, Australia, Asia, and Latin America, by now inscribing the letters EGS in about 2,000 different places around the world. There are photographs of most of his paintings. EGS returned from Kenia the day before we meet, and the next interview is scheduled between his trips to Italy and Murmansk. He finds new contacts online. Travel and leaving your mark is just as important as before the internet. That’s why EGS travels. For unique experiences. Being interested in history, like this artist is, means you always learn something. Most contacts with other graffiti artists in Europe stem back to EGS’s interrail years, when he travelled from one place to another trusting there’d always be a friend’s friend willing to put you up on a mattress or couch. Instead of a place for the night, you were more likely to need a place for the day. Nights were for painting. “These days I tend to stay in hotels”, EGS mutters. That’s how times have changed for street artists. Instead of running away like they used to, they are now busy responding to invites. EGS stands behind a table spray-painting. He is working on a painting for his exhibition at Kunsthalle Helsinki on the theme of lost states. These are countries that no longer exist, which is why the maps have an unfamiliar air about them. The subject of the painting he is busy creating is the Tanger free trade zone. “I’ve been browsing history books and stamps in search for states that have disappeared”, explains EGS. He shows some of the works sprawled across the floor: that there is the Free Territory of Trieste, Perak was in India, Tierra del Fuego was independent for a year. This is Tuvan People’s Republic, over there Matsuko, and there the Free City of Danzig. The idea for depicting lost states came about when EGS was drawing his own world maps. The ones that formed the letters E, G and S.
He became interested in the power of the lines he drew – lines between states. A border is a tool for exercising political power, even if with time it begins to seem neutral. The person who draws a line has a huge amount of power. This is something EGS hopes people who view his works pause to consider. We talk about the box on the African continent that caught the eye in the inflight magazine. Also in the artist’s home country Finland, people were forced to leave behind regions lost in the war according to whoever drew a new line. EGS’s workspace is located on the top floor of a former industrial warehouse, with spring light diffusing through winter-grimy windows. Oh, but why a drug syringe? EGS fills the syringe with black color and hovers it over the painting. Black drops and lines begin to appear on the white canvas. A border. In the spring, Helsinki residents will be treated to EGS’s art in a much more institutionalized venue than a wasteland. Draped on the façade of esteemed Ateneum Art Museum in March was a new version of EGS’s work Europe’s Greatest Shame #11 (2017), which served as a statement of cultural professionals towards human rights and freedom of speech among refugees. The words “Refugees Welcome” were printed on the bottom corner of the sheet. The work stemmed from frustration with the Syrian war and Mediterranean crisis. “Downing white wine and stuffing our faces with feta along the same shores where someone else is drowning in the salty water was a really distressing thought”, explains the artist. Despite EGS’s peaceful, contemplative demeanor, there’s now a sense of fervor in his voice. Once again, EGS finds similarities with Finnish history. About 80,000 Finnish children were sent to other Nordic countries during the Winter War and Continuation War. After high school, EGS studied in Britain for five years before returning to Finland to work in advertising. In Helsinki, there was zero tolerance towards graffiti at the time; it wasn’t allowed and the intention was to criminalize it even more. Now it’s the total opposite – murals are commissioned for apartment block facades, and street art is turning mainstream. How did the graffiti painter become an artist? “But what I paint on the streets can’t be framed just like that”, he explains. Working indoors is another matter altogether. There are frames, exhibition spaces, meetings, timetables, arrangements, viewers’ opinions on what constitutes as art. Street art is similar but the opposite of everything at the same time. It’s all about a right. A right to draw a line. Who has the right to draw in a tunnel or side of a train – or on a map? Are map and graffiti lines related? “There is a connection”, EGS answers. Someone will always draw a line, someone else doesn’t get asked, someone defies the border and it gets moved, as do the rules that apply. EGS mentions Finland’s neighbor Estonia as an example of borders, and the might on the one hand and fleetingness on the other of lines on a map. In the 1200s, Estonia came under the rule of German knights before ending up in the hands of the Swedish and Russian empires. Estonia gained independence in 1918, but was incorporated into the Soviet Union in 1940, and became independent once again when the Soviet Union collapsed in 1991. Plenty of lines have been drawn and redrawn by others. Estonians of EGS’s age were born in the Soviet Union. Despite a distance of only 80 kilometers from Helsinki also then, there was hardly a connection across the sea, which was illuminated by floodlights to ward off intruders. Now you can take a daytrip to Tallinn for a meal or to stock up on cheap beer, with the sea dotted with cruise and charter ships. Berlin is another close example of the power and fleetingness of borders, with residents who have lived in a unified Germany, then in East or West Germany, and in a unified country again. When you travel a lot, you learn about new countries, but also about your own preconceptions. EGS talks about his trip to Transnistria, which is 200 kilometers in length and 20 kilometers wide bordering on Ukraine in the east. It broke away from Moldova on its own accord. With a territory inside the Moldovan borders, Transnistria hasn’t been recognized by any other country. The state may or may not have a huge effect on identity: also language, religion, and ethnicity play their part. With a share of 32 per cent, Moldovan Romanians make up the largest ethnic group in Transnistria. Recent history doesn’t help much in defining specific borders, and weapons are resorted to too often. Transnistria declared independence from Moldova in 1990 just before Moldova itself declared independence from the Soviet Union. In summer 1992, the conflict ended in intervention by Russian troops and subsequent ceasefire. Art doesn’t necessarily offer answers – you need to travel and meet people. But you can examine states as constructions and institutions through art. It can remind of alternatives and history, and spin ideas into motion. “I guess it’s about also waking others to think about how we define people’s identity and economy”, says EGS. Why E, G, and S? Why the letters E, G, and S? “I’ve haven’t told this before”, EGS says suddenly.